rosaries and holy water in their back pockets. a kind of chaos that only desperation brings. for any eligible receiver way downfield. on the run, way deep. A Hail Mary pass. spirals through thin air, arcing high into sun. Poet’s Notes: I was interested in the early use of the term “Hail Mary Pass” in football. 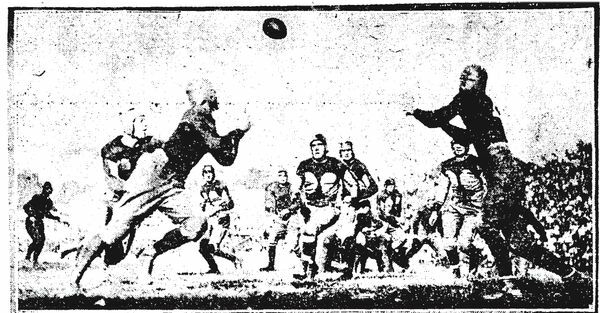 Knute Rockne used the term “Hail Mary play” when his team, Notre Dame, beat Georgia Tech (October 28, 1922). “Our Fathers, They’re Watching,” is a variation of that account, and the title plays on those typical Catholic prayers as well as the 1951 movie Angels in the Outfield (at least tangentially). The structure could be taken as that of a football field (approx. 120 x 53 yd), which is about 2:1 length to width. But I must confess, that I did not make that calculation before I wrote the poem--it organically evolved that way.